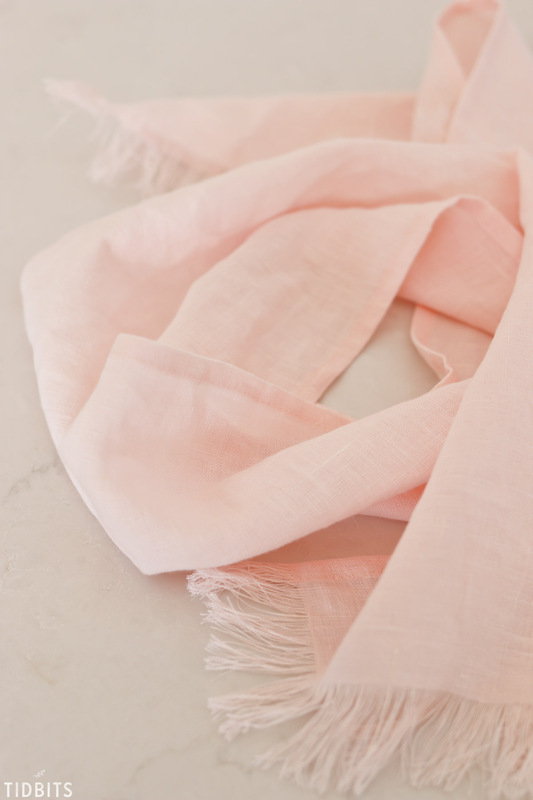 There is nothing quite as luxurious as pure linen, so why not wrap it around yourself!? 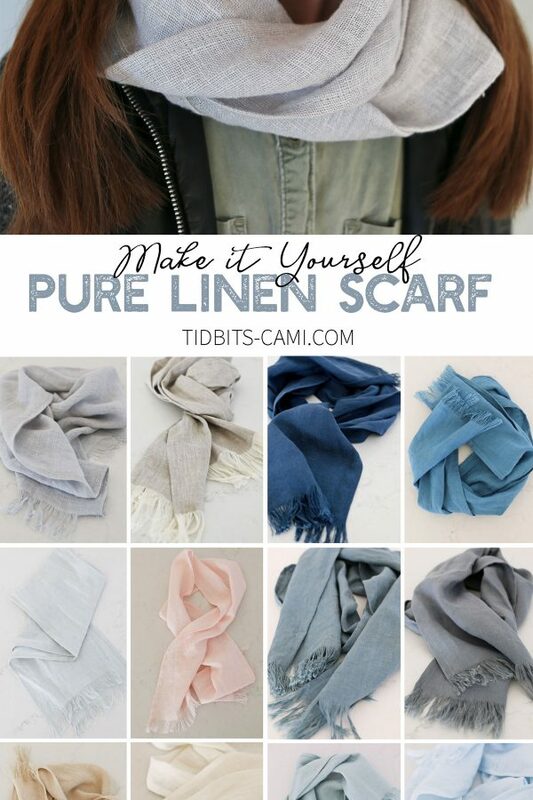 Learn how to make a DIY Pure Linen Scarf and find out where to buy some linen scarves! 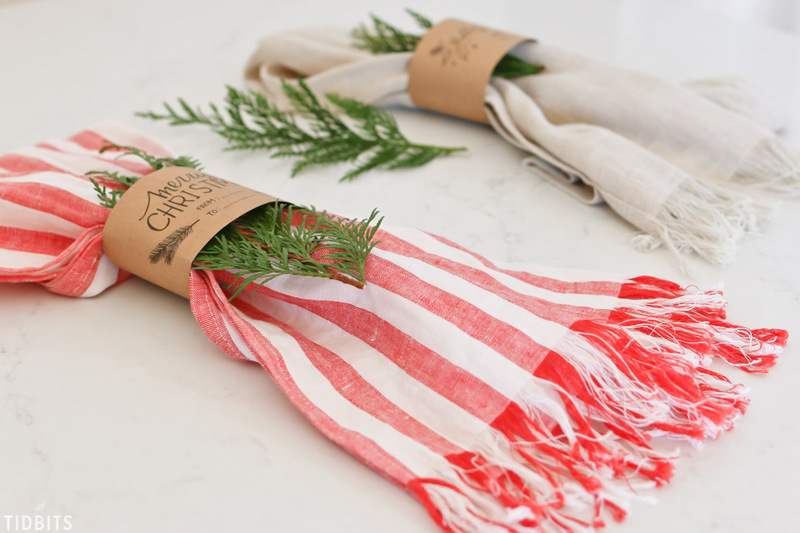 For part of my DIY Holiday gift series, I knew I wanted to show you how to make some scarves . . . but not just any scarves. 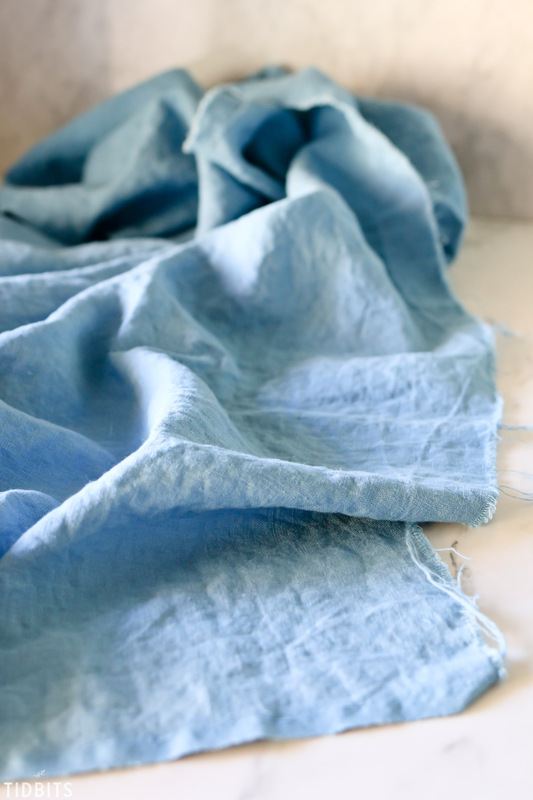 I can never get enough of pure linen. The texture, the organic feel, the natural colors, the nubby weave, the softness in my hand . . . the dreamy fabric that only ever gets better with age and use. 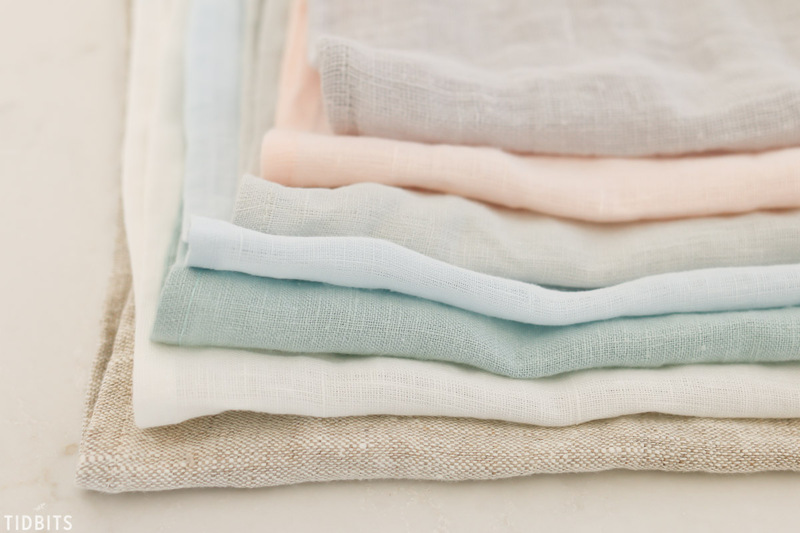 My heart will forever adore pure linen. (and my little scarf model). I’ve been slowly stocking my stash of linen, buying different varieties and finishes from etsy shops, markets, and some online sources. Don’t be fooled into buying linen fabric blends, and only spend your hard earned dollar on PURE linen. Let me now show you what happens when you take your love/obsession of something and let it get out of hand. 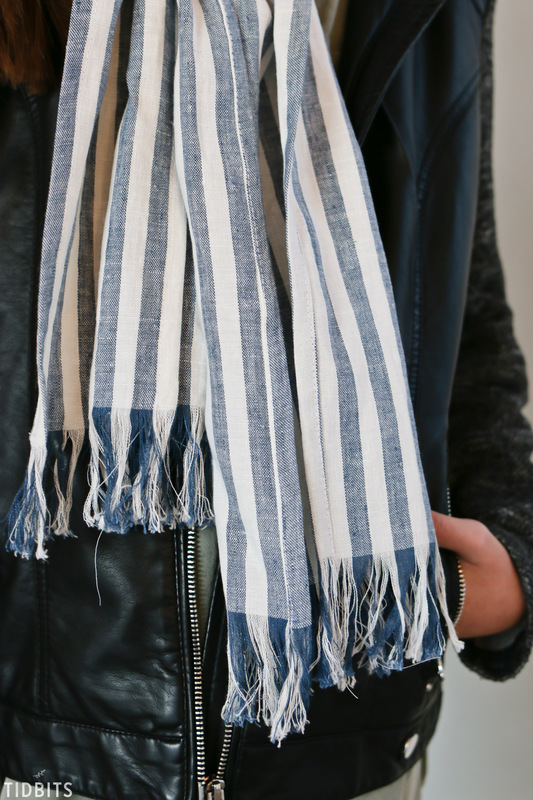 I may have made one too many pure linen scarves! The way I figured it, the best way to enjoy linen would be to wrap yourself up in it! 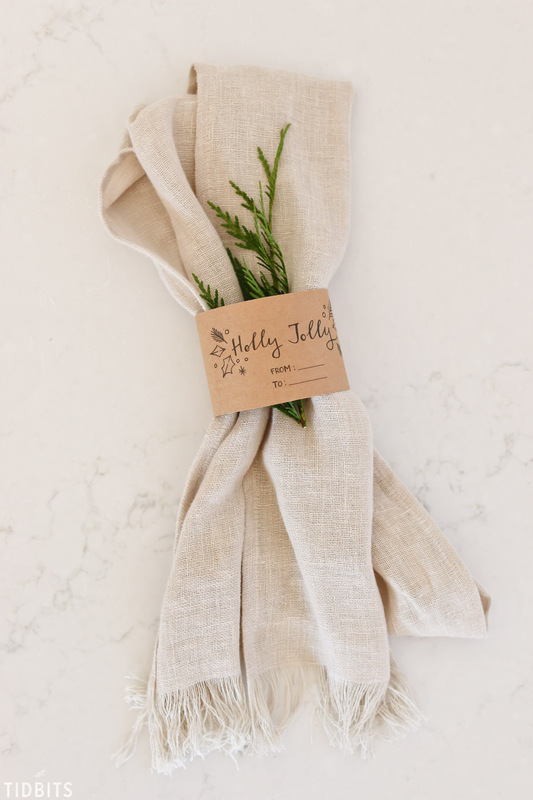 While I am no fashionista, the beautiful simplicity of linen is a classy fashion statement to any outfit. 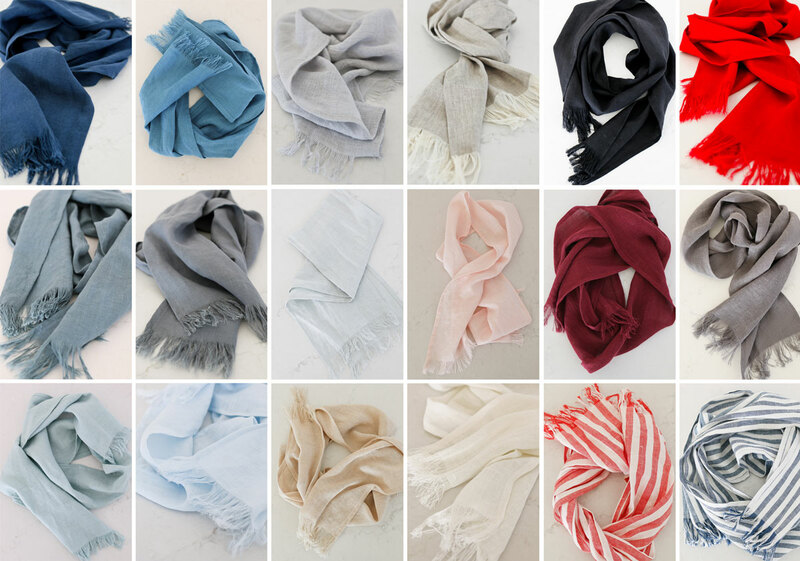 While I am happily going to show you how I make lovely pure linen scarves, I also am excited to announce I have opened up an Etsy shop for those who would rather just buy one! So please pop on over and check out all the varieties and sizes I am offering in my SHOP. I have everything from bold to subtle, tight weave to loose weave, and from extra long to kids sizes. 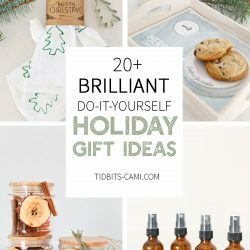 Whether you make them or buy them from me, I think they would make the most thoughtful and unique gift for someone special on your list. 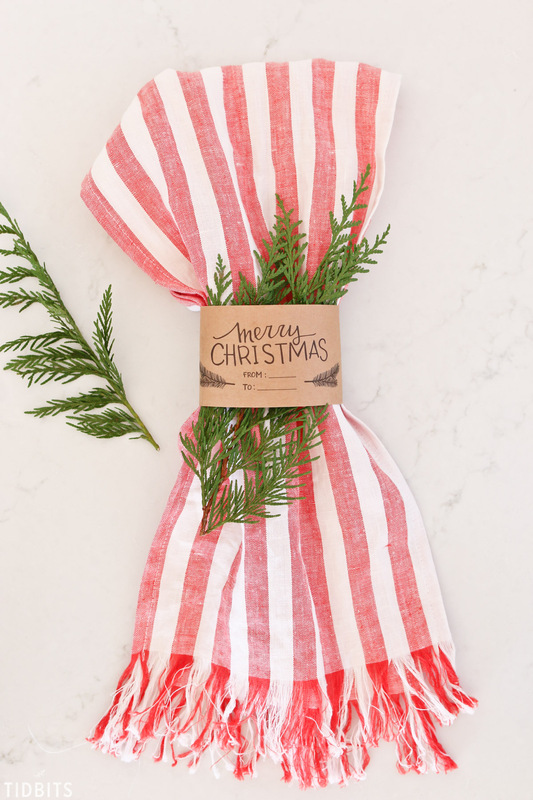 My free printable gift wraps also come in handy for packaging up scarfs, towels and many other items. Be sure to snag those in the TIDBITS SUBSCRIBER LIBRARY, which you can gain instant access to by signing up for my email updates in the form below. *Already a subscriber? No need to fill out the form below. The link and passcode are found at the bottom of every email I send. 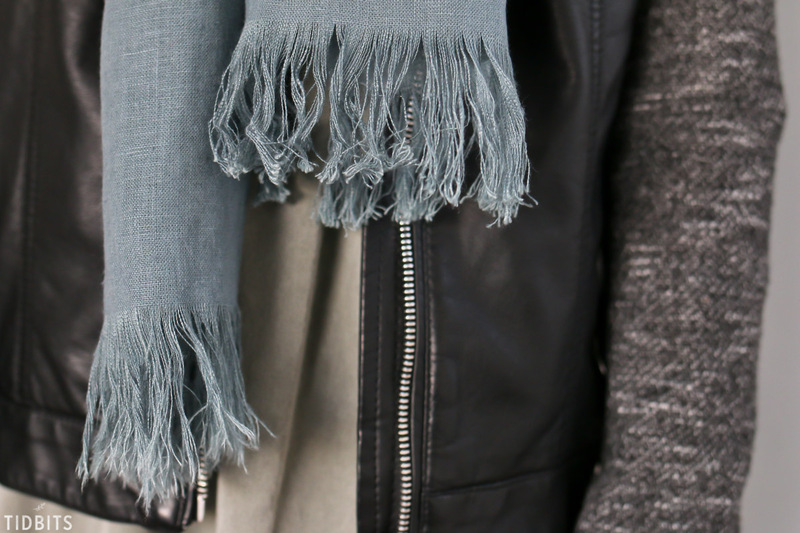 You can easily hem your ends, but I really love the texture and interest a nice long frayed edge adds to the scarf. My kids enjoyed taking part in this project by fraying along with me. 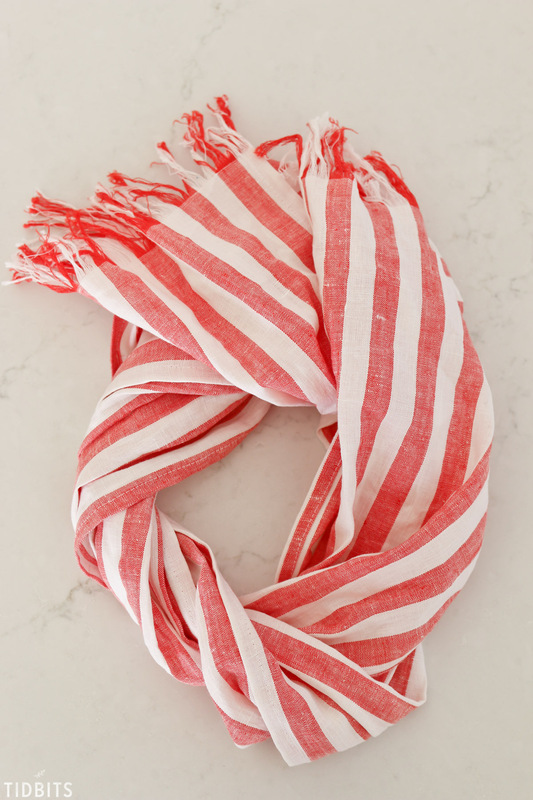 I’ve got multiple plans for the rest of my curated linen stash, but the scarf sewing project is perfect for beginner sewers and for anyone looking for a quick easy project. 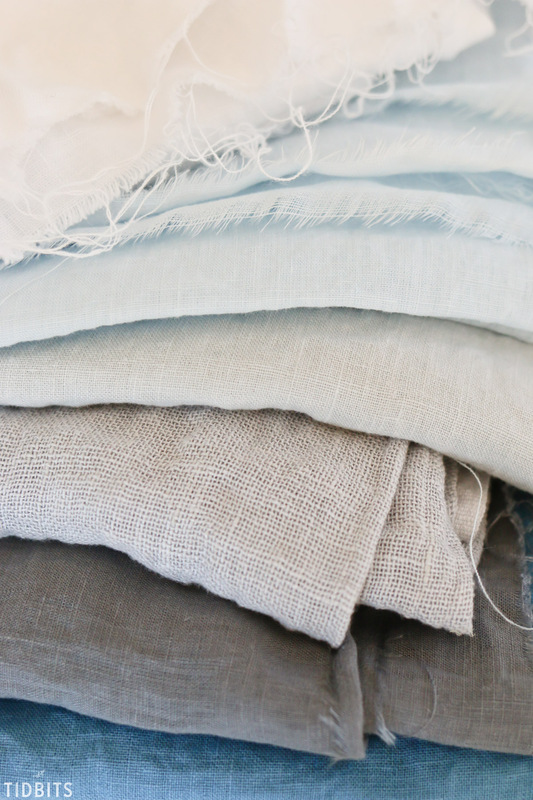 Choose to make one or 20 . . .
Linen comes in all sorts of colors, finishes and weaves, but the price point is also something to consider when buying linen. I tend to gravitate towards more subtle colors, but the bold red seemed very fitting for Christmas time. The few stripped weaves I found are a treasure too! Unless you are lucky enough to live by a shop that sources pure linen, shopping online is the next best option. I’ve watched Etsy shops closely to find the best prices, colors and varieties and I’ve bought from a variety of them. 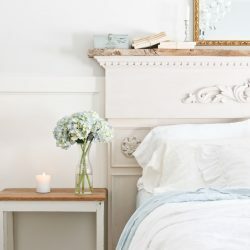 Be sure to read the description and verify that you are buying PURE linen. I’ve seen costs ranging from $10 a yard (which is a scream of a deal) all the way up to $30+ a yard. CLICK HERE to begin your own Etsy search. 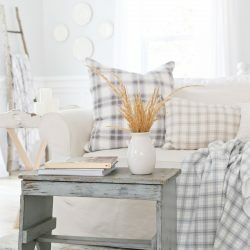 Another great source for a variety of linen at great prices is from Fabric-store.com. It’s worth getting on their email list to be notified of sales, and check out their doggie bags for discounted linen. Feel free to do your own thorough online google search to discover more ways to buy linen. ALWAYS wash and dry your linen before sewing with it. 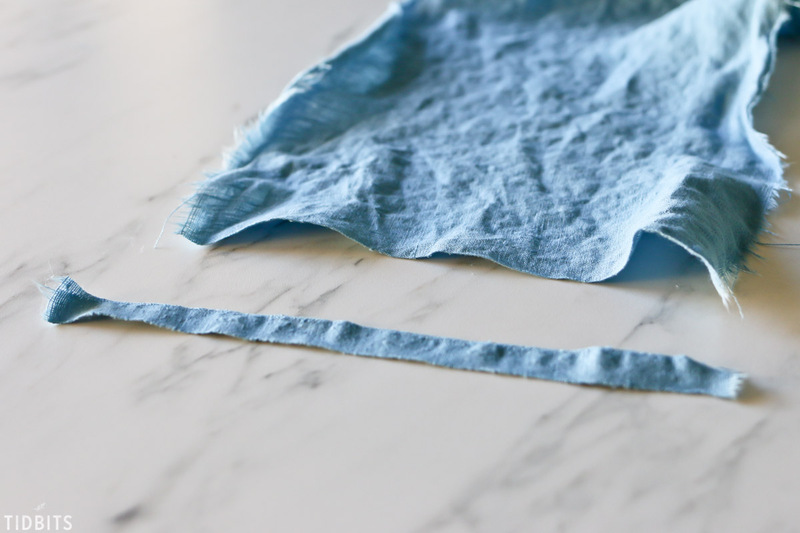 This will preshrink your fabric so your finished project doesn’t shrink in the wash, and also softens the linen making it even more enjoyable to work with. 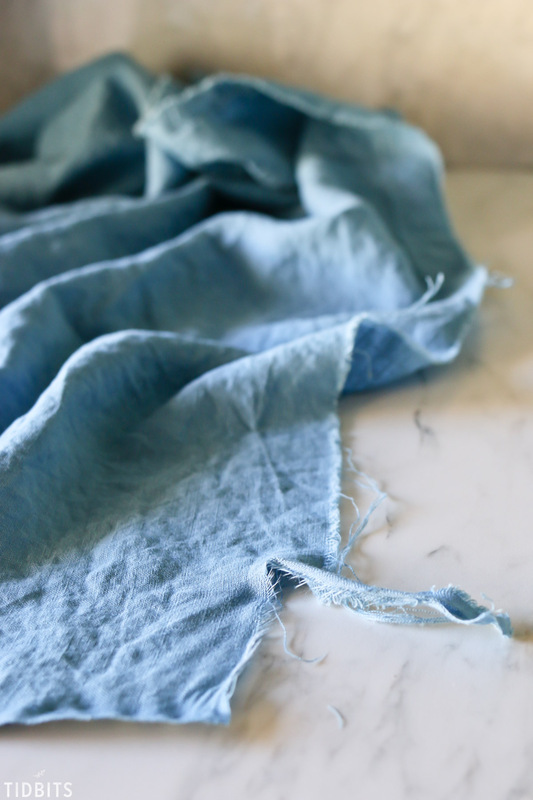 I LOVE sewing with linen! Many more projects to come, I assure you! 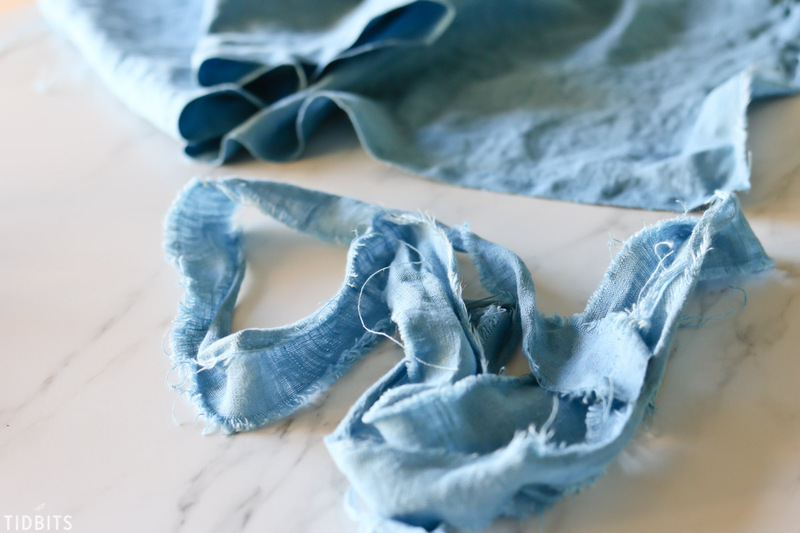 So gather your own stash, and let me show you how easy it is to make a pure linen scarf! 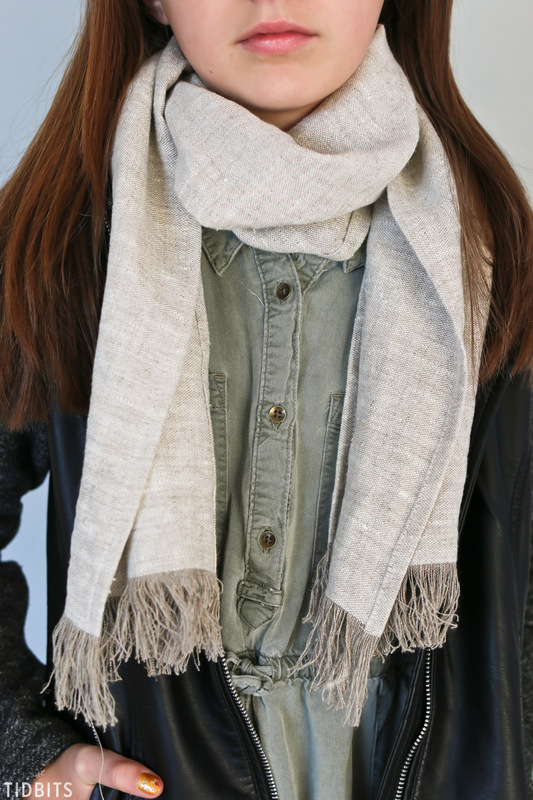 First determine what length you would like your scarf. 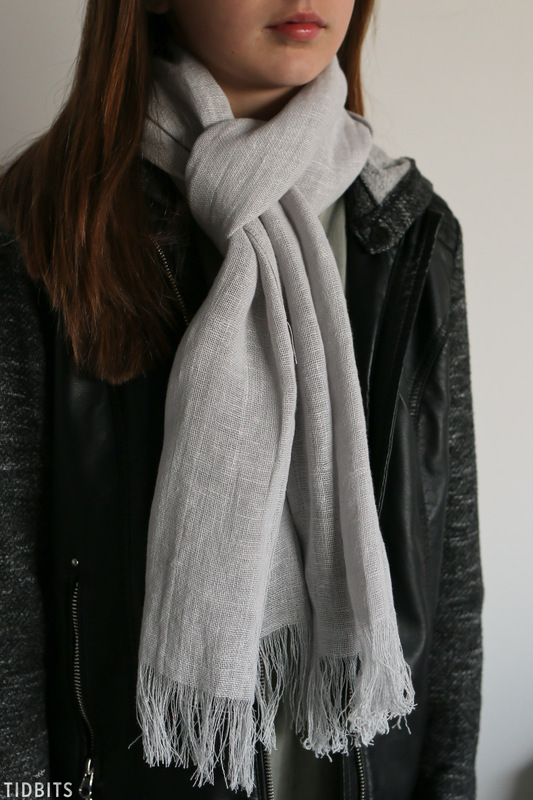 Extra long scarves are great for men, women, youth and are best if you are wanting to creativity fold and drape your scarf around your neck. 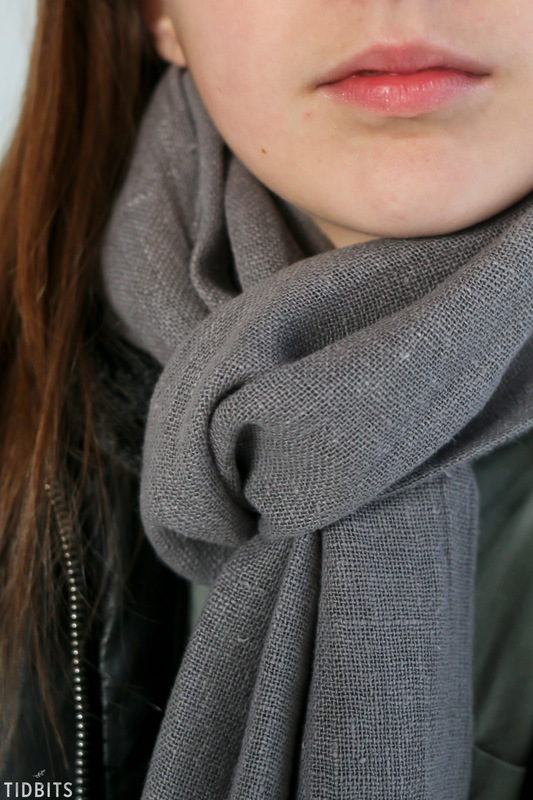 Shorter (or average) scarfs are great for kids and youth, but also great for adults if they plan to wear their scarf simply just laying around the neck. 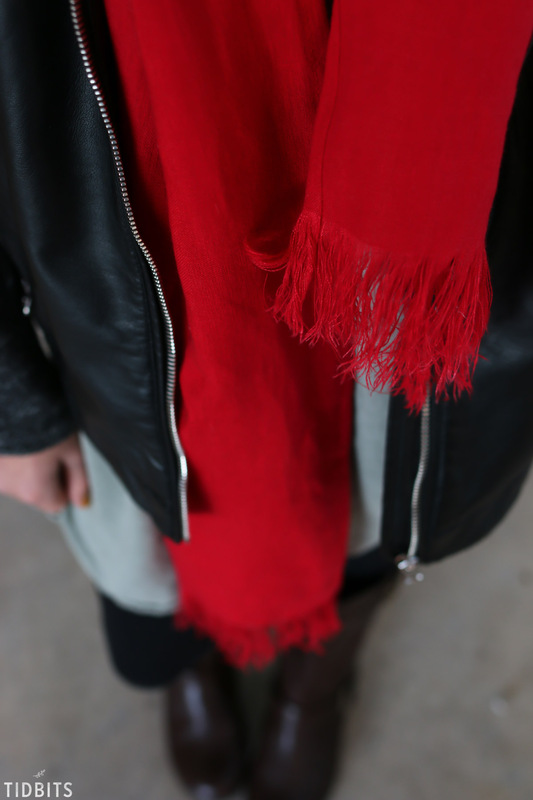 Your finished scarf can be anywhere from 8-10 inches wide, with my recommendation for adult width to be on the wider side of a finished 10 inch width. 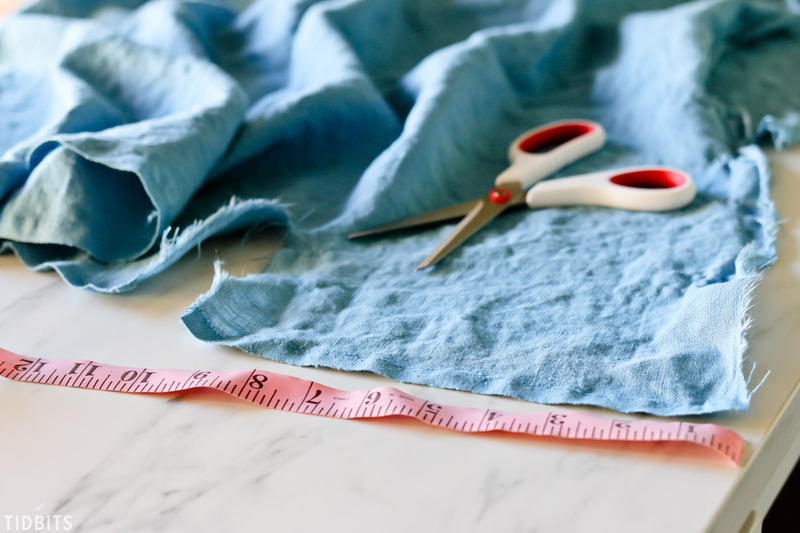 Keeping in mind seam allowance on the hems, plan to cut your strip of fabric at a generous 12 inches, or less for kids or if you prefer a less bulky scarf. 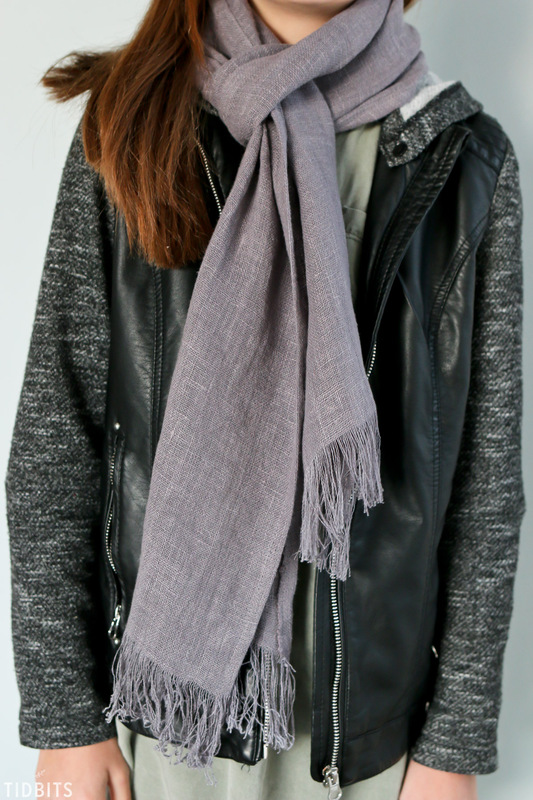 Be sure to buy the appropriate length in yardage for how long you want your scarf. You’ll first measure off and cut the length you need. This should be exact to your measurement. For example, if I want a 75 inch long scarf, you should cut the length at 75 inches. Because linen is a woven fabric, you’ll first want to get it on grain before you cut the width. 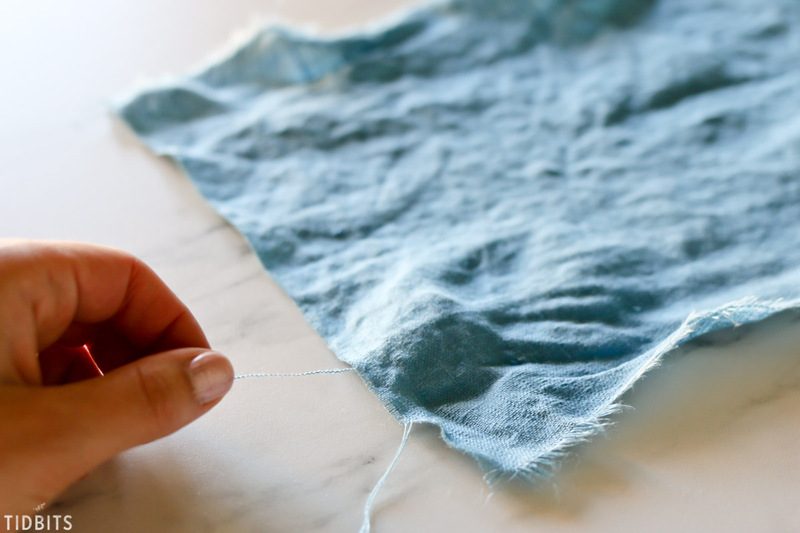 To do this, simply cut a small slit on the edge of the fabric and tear or rip all the way down. Measure the width you desire and cut a second slit. Proceed to rip all the way down. This rip method is not only fun, but a great way to get a perfect and even width on your fabric piece, since it should rip right down the grain. If you have a selvage edge, you can also trim that off. 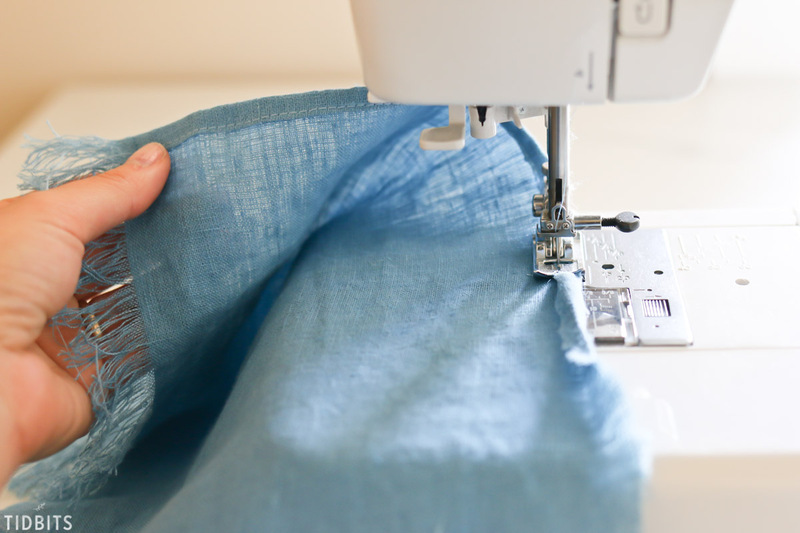 If you choose to have frayed edges, you will need to fray before you begin to sew anything. 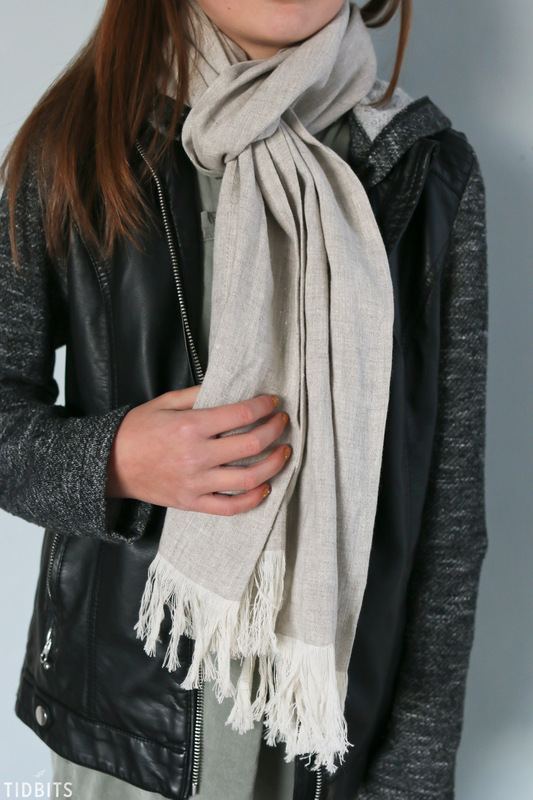 Simply pull the threads a string at a time running the width of the scarf. Continue pulling the threads and discarding them until you have the fray you desire. 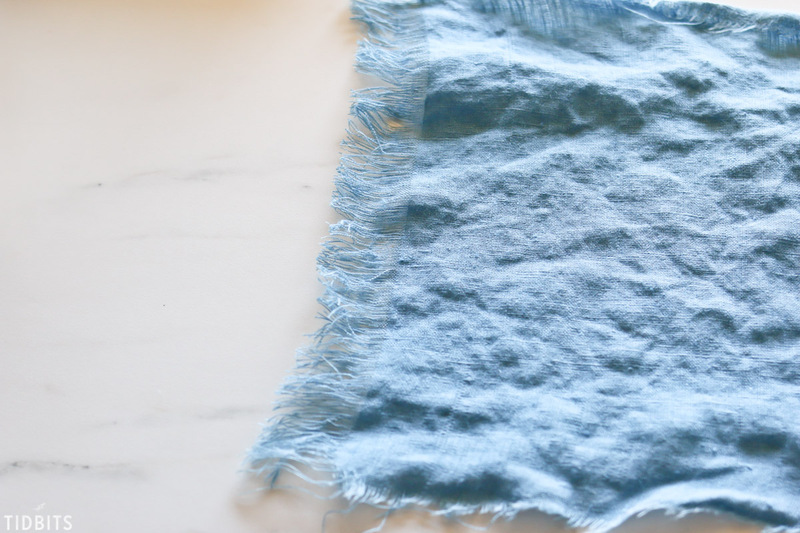 If you pre-washed your fabric (which you definitely should have!) I recommend giving it a nice press with the iron before you begin hemming. 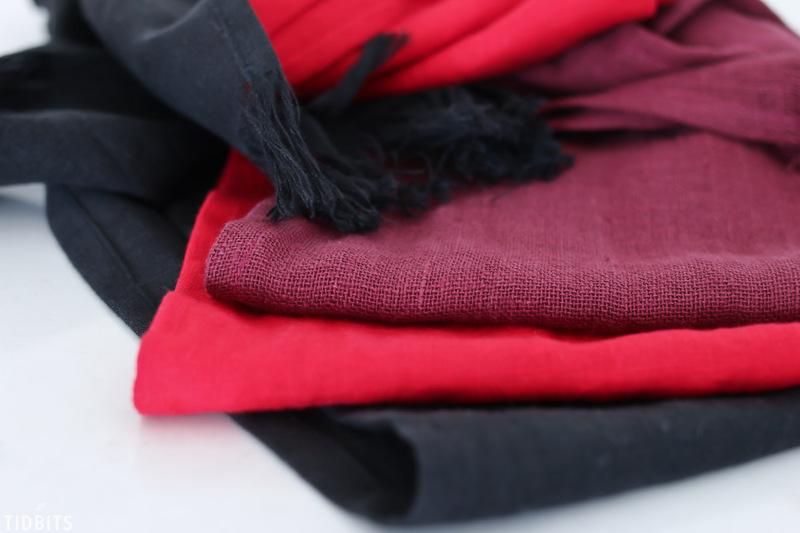 To hem the long edges, just fold over the edge inside itself and hem the length of the scarf. 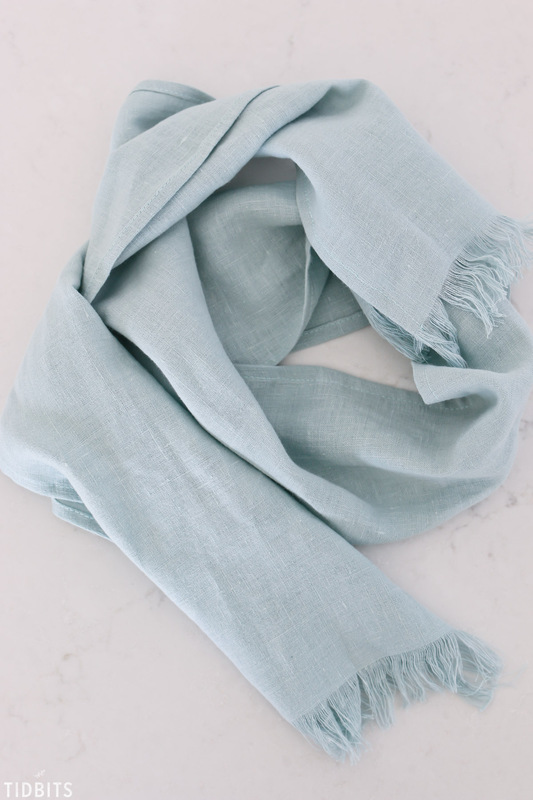 I might also add, linen doesn’t typically have a wrong or right side, so it should look beautiful on both sides making it the perfect fabric for a scarf! I hope you’ve enjoyed this tutorial and I hope you’ll take a minute to stop by my SHOP! Mr. TIDBITS even got into a project and I’ll be adding some of his beautiful woodworking items to the SHOP soon! I can’t wait to show you! 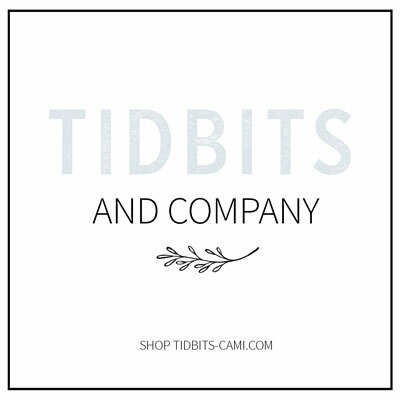 By the way – this SHOP thing is a new venture for us. Please let me know in the comments below if you like the idea of us selling some of our handmade goods and if there was anything you would like us to consider adding to the shop. I’d love to hear your thoughts! Those look wonderful, Cami! Congratulations on opening your shop! 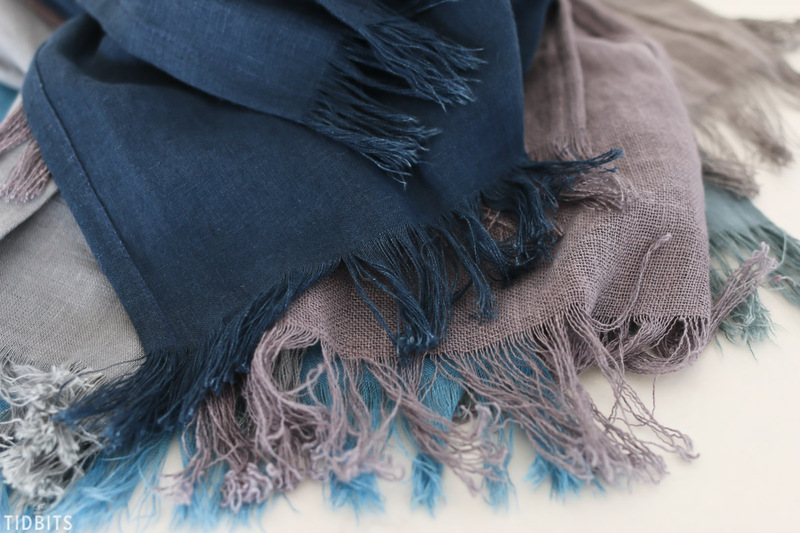 Each scarf looks luxurious; I am with you, linen is my all-time favorite fabric–I am a bit of a hoarder and can’t wait to unpack the yards of it I have boxed up and get to sewing again! 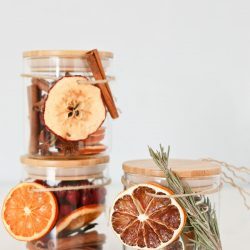 I think it is a wonderful idea to make and sell your hand crafted goods. Few people have the time or skills to do this so may be looking for the already made product. This is my first time commenting but have followed your blog forever. I have prayed for you as you listed your house and will continue to as you build. I love how you take what God has given you and make it a blessing. I also think it’s wonderful that you make your projects a family affair while teaching your children that a gift comes from the heart and not necessarily the mall. 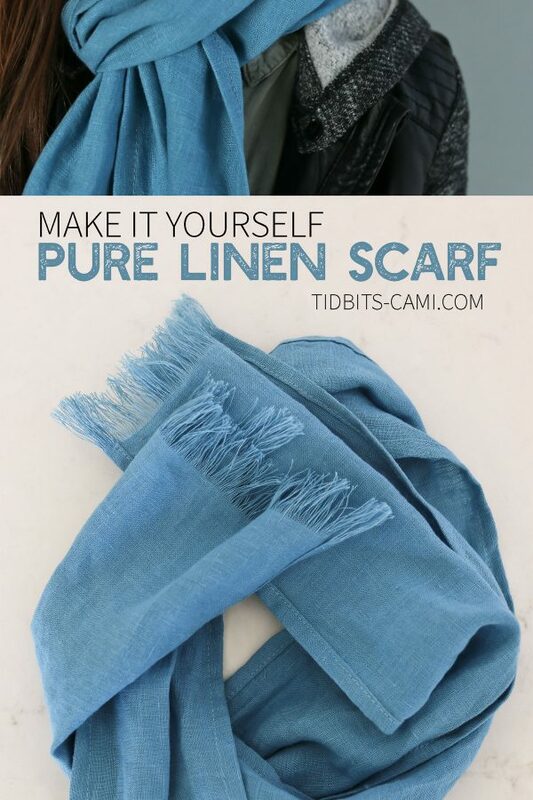 Cami, I adore your linen scarves!! Great job and congratulations on your shop. 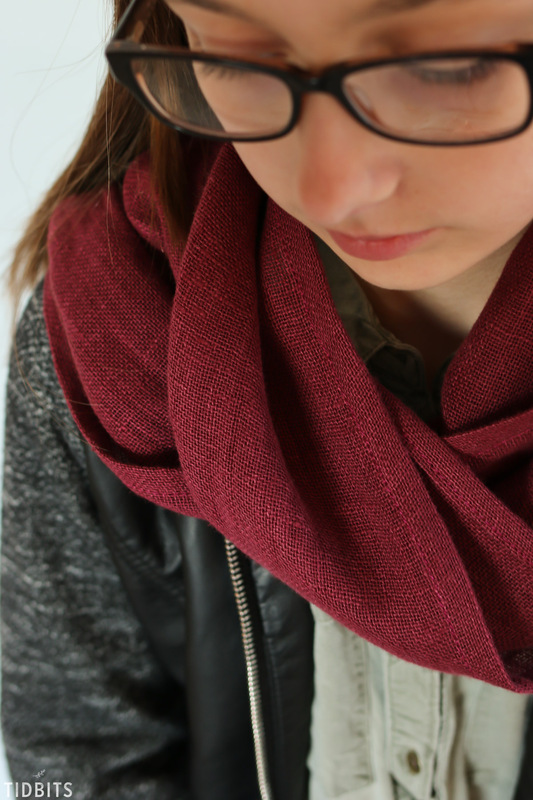 I only have wool scarf, I guess this year I find (at least) one linen scarf, they looks so great! Thank you for sharing!